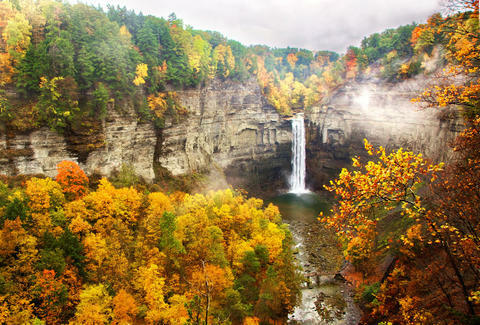 Because TLC isn’t the boss of you, go chase all the damn waterfalls you please this weekend (and, really, every weekend), starting with these 10, the most CrazySexyCool ones the Empire State has to offer. 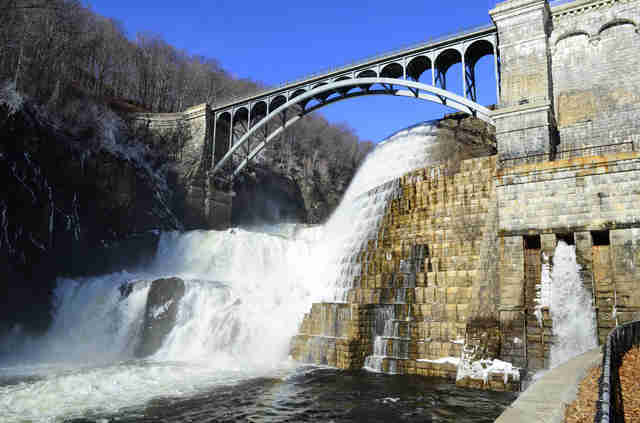 Major upsides to this waterfall: 1) it’s a super-quick (and cheap) train ride from the city, 2) there are great views from Croton Gorge Park, and 3) if you feel like a quick hike, you can get really near the base of the waterfall on one of the nature trails. This dam is also really unusual: half of it is man-made and the other half is natural -- we’ll let you figure out which is which. How to get there: It’s an hour-long drive up I-87 if you’re taking a car, or less than an hour if you hop on the Metro-North Hudson line for four stops up to Croton-Harmon, and then take a taxi 3.5 miles to the park from there. How to get there: It’s about a four hour drive from the city, or you can take the Amtrak to Syracuse and then the Ithaca Airline Limousine to Ithaca if you’re super broke, or just rent a car there. If you’re really not into hiking but still want to see a natural waterfall and go swimming in a pristine, waterfall-churned pool, this is your spot. It’s a super-short hike -- like a little more than half a mile each way -- and the waterfall itself is kind of a hidden gem. How to get there: Drive 60 miles up the Palisades Interstate Parkway (this will take about an hour and a half), or take the Metro-North Hudson line to Cold Spring, then a 2.5-mile cab ride to the Marsh Audubon Center and Sanctuary. 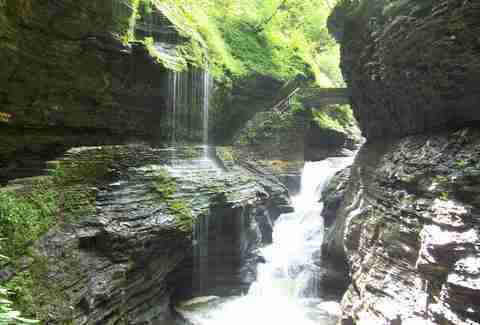 Watkins Glen is waterfall central: this place boasts 19 waterfalls total, and they’re all pretty spectacular/will make you feel like you’re one of the elf dudes in Lord of the Rings whilst surrounded by them. Rainbow Falls is especially amazing because there’s a carved stone-bridge hanging out over it, and you can hike around it, and walk behind another waterfall while looking at the first waterfall, so double waterfall. How to get there: It’s about a 4.5-hour drive up Route 81, or take an Amtrak train to Rochester, then rent a car and drive 1.5 hours Watkins Glen. The falls drop a stunning 215ft -- that’s the same height as the Pyramid of Menkaure in Egypt, and 50ft higher than Niagara Falls. Granted, it doesn’t have the same kind of massive oomph as Niagara, but it’s a seriously impressive waterfall -- and it’s one of the highest rocks this side of the Rockies. There are great trails on both the gorge and the rim, and there are both boat rentals(!) and cross-country skiing options nearby, so it’s great in all weather. How to get there: This trip is about a 4.5-hour drive up I-81, or take the Amtrak to Rochester and rent a car from there. 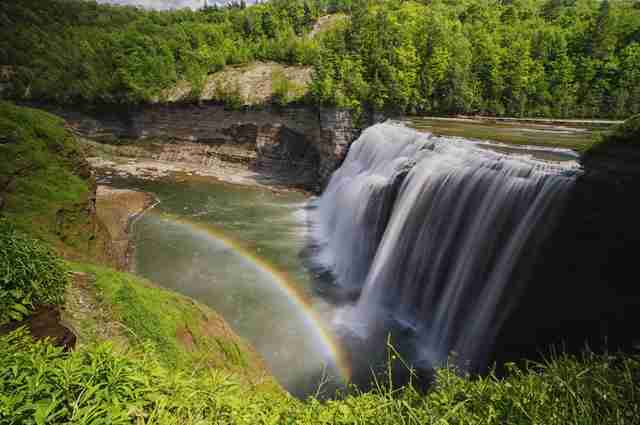 This is the “Middle Falls” of the Genesee River, but it’s the biggest of the three. It’s wide, gorgeous, and drops into what’s nicknamed “The Grand Canyon of the East.” Also, there’s a paved walkway available for non-hikers. The park actually affords a lot of waterfall opportunities: the Lower and Upper Falls of the same river are a short walk away, and you can hike out to Inspiration Falls, which is arguably the tallest waterfall in New York. Bonus: the park is down with you using it for hot air balloon rides. How to get there: Rent a car and take the 5.5-hour-long drive, take buses for 20 hours (NOPE! ), or fly to Rochester (one hour) and rent a car, which is probably like 4.5 hours all in. 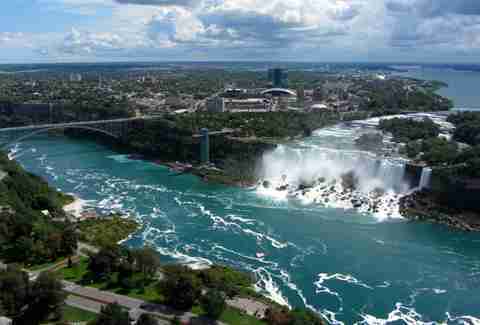 It’s the most famous waterfall in America, you guys. You can take boat rides, helicopter rides, drop your rent money in a casino, hike through the “mist zone,” eat ridiculous meals… it’s kind of a thing. Don’t bother waiting for your honeymoon like a couple from the 1950s, just go for a weekend. How to get there: It’s a 6.5-hour car ride from the city (yeek), a nine-hour Amtrak ride (actually more fun? ), or a one-hour flight to Buffalo (yes). 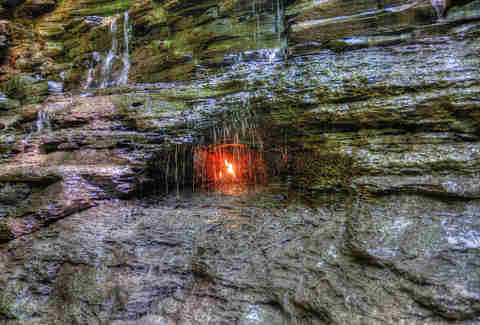 Due to a natural gas pocket, there’s an eerie flame that rises up from behind this relatively petite, 30ft waterfall. Technically, the gas source is eternal (or... consistent), but hikers light and relight this flame as it goes out, so bring your Zippo with you. It’s strange and unique and one of the most beautiful places in NY state you didn’t know existed. How to get there: Ok, it’s a seven-hour drive from the city (not great), or you fly into Buffalo and grab a car from there (way, way better). 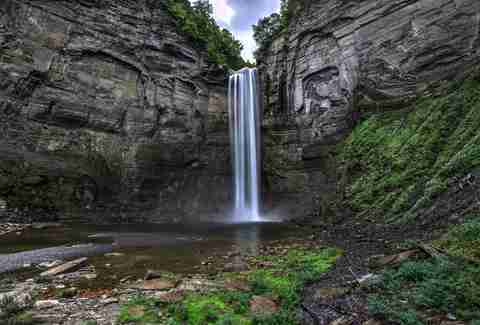 This is the waterfall you think of when you close your eyes and envision a waterfall, you know? You can also go swimming in the base, and wade directly beneath the spray. 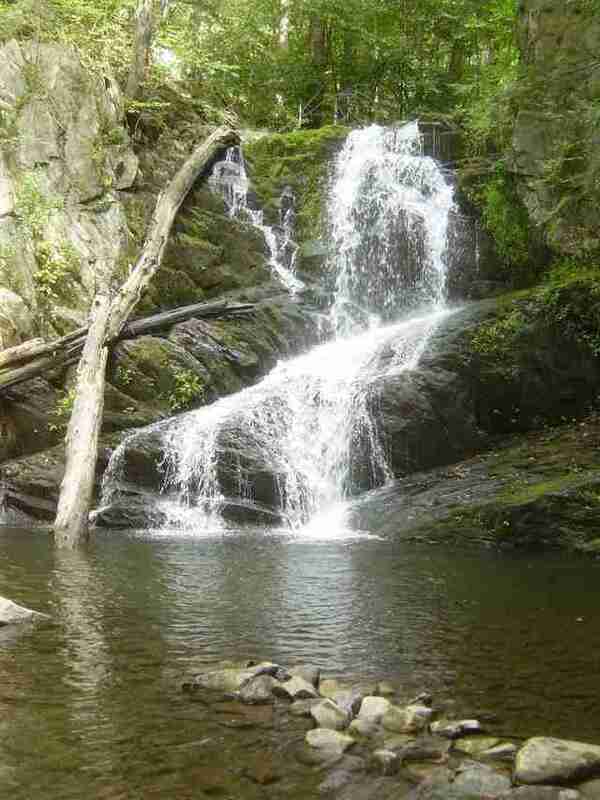 Plus the hike to the falls isn’t crazy long (only about a mile). 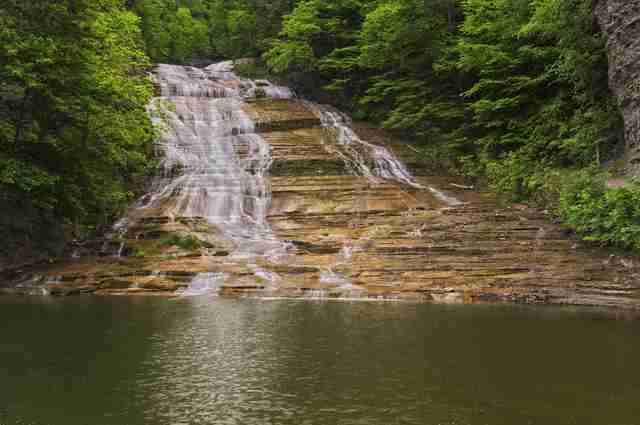 It’s located in Havana Glen State Park, which is home to a couple of other smaller waterfalls, which you can choose to either enjoy or openly mock for their diminutive stature en route to the main attraction. 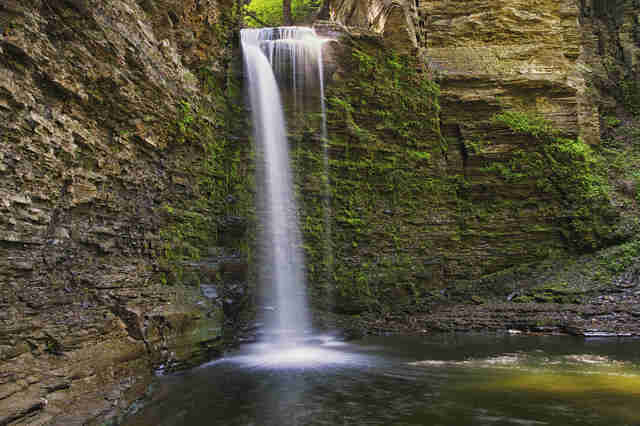 This is pretty easy access, and less popular than Watkins Glen State Park. How to get there: It's a pretty reasonable four-hour drive without traffic. 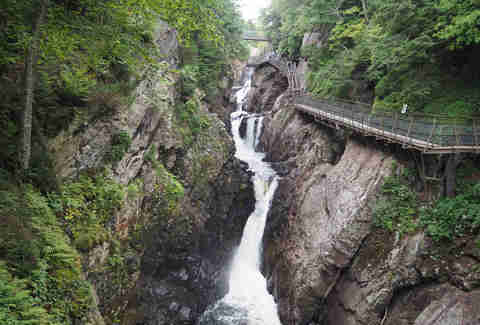 The Adirondacks offer a bunch of great waterfalls, but this one offers walkways all around the rock cliffs, so if you don’t suffer from vertigo, it’s kind of jaw-dropping. Plus, you can mine for gemstones, if that’s a thing you’re into. And they’ll serve you a beer at the connected restaurant, which is definitely a go. How to get there: It's a 5.5-hour road trip, or you can take a similarly timed bus to nearby Lake Placid. After writing this story, Jess Novak has TLC stuck in her head on repeat. Yup, you know the one: "No Scrubs." Stalk her on Twitter and Instagram.